A good lightning kind of night. On dull, ho-hum, here-I-am-on-my-couch-again nights, I long for something to stir the pot. Something to add some sparkle and accent to an otherwise bland canvas of routine existence. Something like tonight. For over an hour, I've been sitting in my living room which is surrounded on three sides by windows and take in strike after strike of lightning, the rumbling and rolling of thunder. 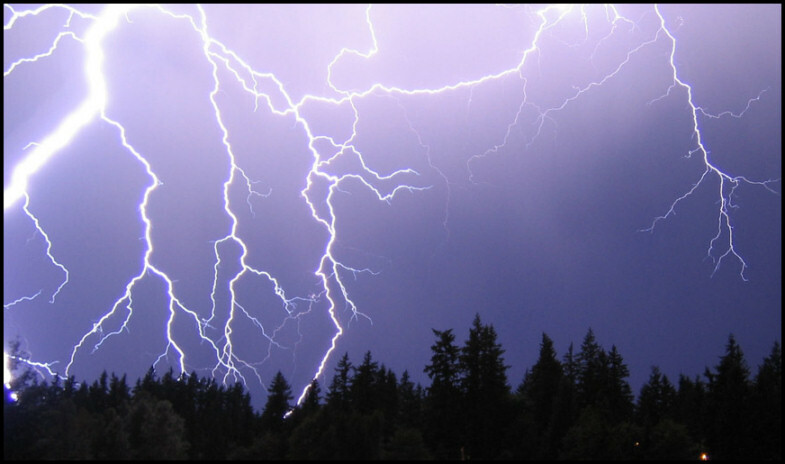 People describe thunderstorms as nature's fireworks. Fireworks shows spark my interest; thunderstorms capture and command my wonder. When I scroll through the guide on my TV screen to see what's on and find a show about lightning, I immediately bite and watch every minute. When I pass a photography book in Barnes & Noble on lightning, I stop and flip through every single page. When I'm trying to fall asleep but am bored to death and pining for something more, I pray for lightning. On a drive back from visiting friends in Chambersburg, PA last month, I was caught in some crazy thunderstorms for a good hour and a half. Through my rain-splattered windshield, I was watching lightning strike seemingly right in front of me. This simple drive, after a summer of great, great friends, a trip to Seattle, a 24-mile hike through the Adirondacks (more on that later), is in my top-five moments of the last few months. Something about the suspense in looking through darkness, the sound of free-falling rain drops meeting the roof and porch, waiting for the next flash simply makes me happy. I love the sudden thrill of seeing the world around me light up, bright white and so unnaturally captured for that split second. Before I can catch my breath, the thunder rolls into my chest. Thunder is so crazy to me because even though it makes a sound that I would liken to the earth's foundations shaking, it comforts me. Well, the low, rumbling thunder, anyway. The sharp high thunder that comes out of nowhere just makes me want to wet myself. Thunderstorms are just another juxtaposition of fear and wonder that make me realize who I am, and who God is. God is the one who created this universe, this crazy planet we live on. He's deeper than the darkest, unexplored parts of the ocean; He's more jaw-dropping than any of the looming, heavens-reaching mountain peaks; He's more powerful than the hurricanes that rip trees from the ground; He's more beautiful than the rays of the setting sun hitting the desert rocks in Arizona. I'm a tiny boy with wide eyes and shaky knees, taking it all in with wonder. I used to dream about nights like this, about lightning painting everything in white and thunder shaking the floor and walls, and sitting up with someone special, watching the whole show with accelerated heart rates. I may be jaded these days about trying to bring someone along for the ride, trying to buy two tickets to a show and hoping for a mutual response. Maybe a few months ago, a night like this might make me more disappointed, more sad that I can't share my wonder in the moment. If I've learned anything this summer, though, it's this: I won't let anything steal from me what life is raining down and willing to give. That's why tonight has been a good night. Newer PostPoem a day for 30 days. Day #1. Older PostSeattle, Day 7: Double paddleboat! !